Vacuum Insulated Flask/ water bottle keeps hot up to 18 hours and ice cold up to 36 hours! ★ AWARD-WINNING DESIGN: twist-free, thread-less lid allows you to single-handedly open/close your water bottle with ONE click in ONE second! RevoMax Stainless Steel Vacuum Insulated Bottle unique double-seal and triple-lock mechanism guarantees TRUE leak-proof! ★ HIGHEST QUALITY AND FINEST CRAFTMANSHIP: 18/8 stainless steel, BPA-free plastics and food-grade silicone rubber. ★ Triple lock for leak protection guaranteed. 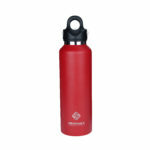 ★ Durable powder coated exterior, bottle doesn’t sweat and easy to grip. ★ A unique pressure relief valve when holding carbonated beverages. ★ By switching from disposable bottles we can make a bottle a better home. ★ EASY TO CLEAN: All parts come off for easy clean and hygiene purposes.